NOW: Nearly 70 years later, it seems that none of the businesses in this first block of Roosevelt Way north of 64th Street survives. This low-rise commercial avenue with diverse signs, street awnings, and poled power is Roosevelt Way looking north through 64th Street on Sunday May 7, 1946. It is a typical mid-century American hodgepodge, by now nostalgic. Similar to a few other local intersections then, this one displays one commanding eccentricity, a Van de Kamp bakery’s landmark windmill. At this northeast corner everything within and without was, to quote the company’s promotion, “artistically decorated in delft blue and white,” except, of course, the baked goods. There were 150 of these, including the “17 kinds of old Dutch coffee cakes,” noted on the sign above the awning. All were “guaranteed fresh every day.” Inside the windmill were the “Dutch Girl” hostesses, who wore flamboyant hats that resembled the wings of a plumpish swan extended for a landing. For the formal opening on August 7, 1929, the company invited all Seattle to visit its “fifteen beautiful stores.” Less that four months later Van de Kamp’s claimed nineteen locations, with an ambitious ad that included a photograph of this Roosevelt store. The company continued to grow during the Great Depression and promoted products into the 1980s, but by then within supermarkets. That is how I remember them, with windmills limited to in-store signs and on logos for its products, many of them by then frozen. One door north is Brehm’s, a pickle fancier’s deli that got its modest Pike Place Market start in the teens, and like its neighbor the baker, kept growing, reaching “fourteen convenient locations” in 1941. At the north end of this block is Sears, which opened at the corner of 65th street in 1929 and kept selling there for half a century, closing early in 1980. 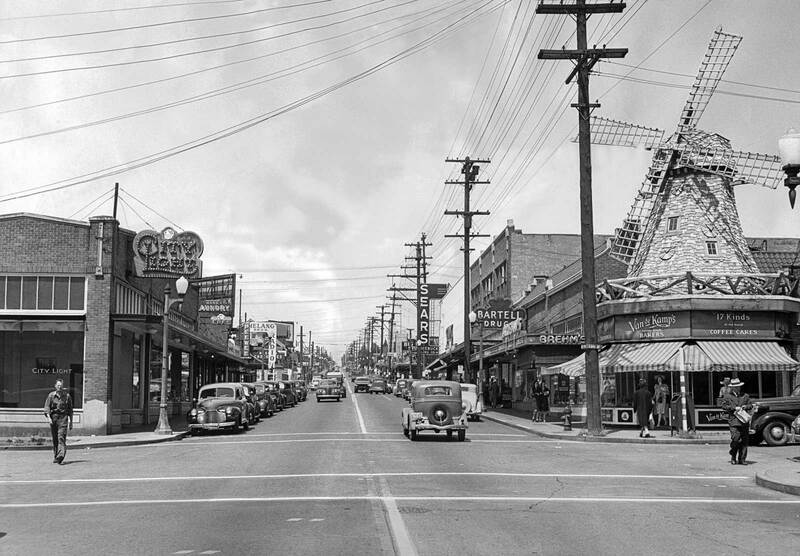 A Seattle City Light neighborhood service center at the northwest corner of Roosevelt Way and 64th Street, on the left at 6401 Roosevelt Way, also opened in 1929. The state later stocked one of its first post-prohibition liquor stores next door at 6403 Roosevelt Way. The current occupant at the old City light and state liquor corner is the Sunlight Café. Its longevity is impressive. When it took occupancy in 1980 the Sunlight was one of merely three vegetarian restaurants in Seattle. Now there are dozens. I confess to having been routinely comforted by its menu since it first opened. Although he is no landmark windmill, Joe Noone, one of the Sunlight’s worker-owners, is mildly eccentric. Joe is a classics scholar who might be found reading ancient Latin or Greek after creating a generous vegetable tofu sauté or a Sunlight Nutburger. Our extras may be sparse this week, but perhaps Ron Edge will add a few links….Ron? Just a couple related post this week Jean. Previous PostSeattle Now & Then: First Avenue South, 1961Next PostFALLING IN THE KITCHEN, THURSDAY LAST – WITH UPDATE! The caption on the “Now” is perhaps overly bleak. 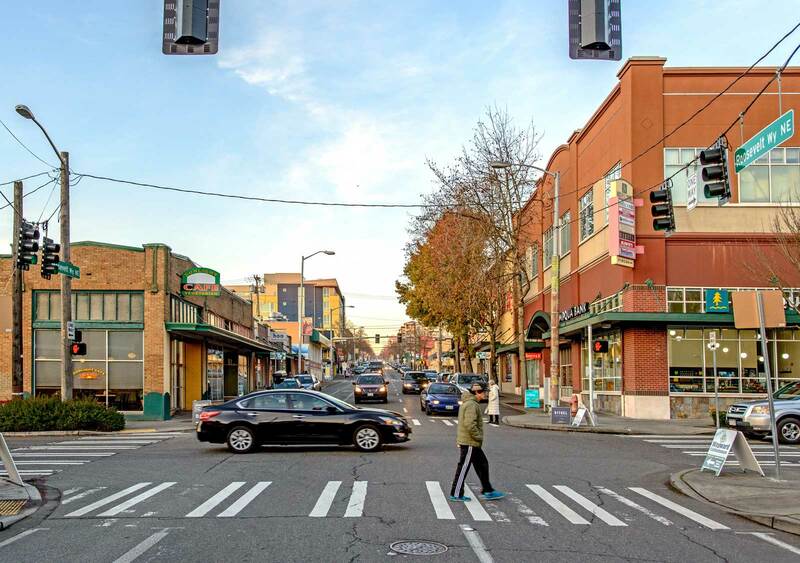 Past Brehm’s is a Seattle staple whose modern red & white banner is visible on the corner where Van de Kamps stood. The building is different, but there’s still a Bartells on 64th and Roosevelt. I recall the Sears there for many years. For a long time the Bartell was just north of the Sears across NE 65th, now back on 64th in the Roosevelt Square. Great picture. I was born too late to see the Van de Kamp there. I’d forgotten about Van de Kamp bakery until I saw your photo. I loved their pumpernickle bread! Would sometimes stop there on my way home from Roosevelt High, and during later years, too.